You'll be £25.00 closer to your next £10.00 credit when you purchase A Pageant of British Steam. What's this? 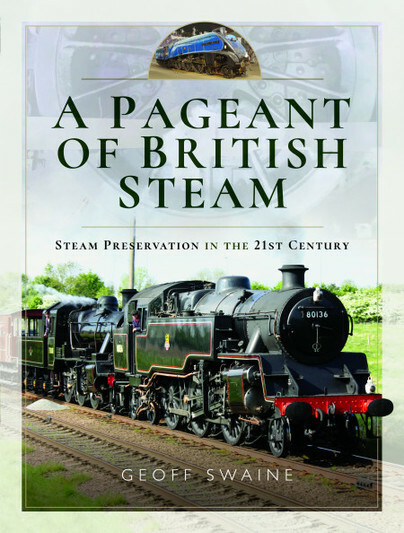 A Pageant of British Steam is a book honouring the position to which Britain’s Heritage Steam Railways has now arrived. Preservation has become the word for the achievements of the thousands of volunteers who have given up a mass of time to advance the saving of this section of Britain’s history. Most of these people are the likely descendants of our Industrial Revolution where the skills have never been forgotten. The book shows in fine colour photography the wonderful selection of locomotives and rolling stock running on our preserved lines – all across the country. Text highlights the historical background of railway history from the earliest times right through to the ‘end of steam’ in the nineteen sixties. Geoff Swaine has emerged to be a leader in this field of photography, be it lineside or heritage working steam. His style is one of his own, where the subject leaps from the page, usually bathed in fine sunlight with blue sky above. Informative captions accompany every picture not only targeting the novice or newcomer to the subject, but the experienced rail enthusiast will also be pleased to learn a thing or two. This book strongly features the historical background as well as catching some of the people who now revel in dressing the part to prove their love of this enthralling and popular subject. The author does a superb job of writing for the newbie and experienced, its a topic that might not tick everyone's box but for me, it was a great escape into times gone by. This book shows a selection of photographs of the locomotives and rolling stock circulating along the preserved lines of the United Kingdom, highlighting the historical background of the history of the railway from the most remote times to the "end of steam" in the Sixties. It also presents the people who are in charge of their conservation and the historical antecedents of this preservation. A book that fans of locomotives and trains will like preserved and that serves to compare how well this issue is dealt with in the United Kingdom with respect to Spain. Geoff Swaine was a war baby growing up firstly in Somerset and then London. Being in the centre of London as a boy in the fifties he had access to all those big London Stations. Kings Cross being his favourite often waiting until 10pm to see the night mail out from Platform 10. A job as a signalman’s assistant after leaving school lasted a short while before he took up a career as an architectural draughtsman. It was a redundancy in the nineties which led him to get interested in photography and photographing steam engines. A book was published in 200 which turned out to being the first of several. The latest being ‘Pageant of British Steam’.